Mr. Cook has held his current role with the Faubus Firm since 2014, after a career serving the law in Texas. Now 80 years old, he has no intention of retiring, and hopes to be “on this side of the grass” in five years. Though lighthearted, Mr. Cook has held some serious positions, including an appointment to the Texas Film Commission by Governor Mark White, and to the Texas Judicial Council by Governor Dolph Briscoe from 1978 to 1982. He was recently named America’s Most Honored Professional of 2017, as well as one of the 2017 Best Lawyers in Texas by the Wall Street Journal, among other awards. 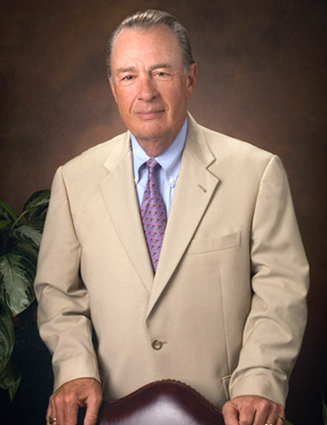 Mr. Cook has served the profession of law for 56 years, and is known for representation in civil and complex commercial litigation in the trial and appellate level, particularly lender liability claims, particularly in energy, arbitration, and mediation. After attending coursework at Tulane University in the late ‘50s, Mr. Cook completed a LLB at the Baylor Law School in Baylor University in 1961. He later completed a diploma from the A.A. White Mediation Institute, now the A.A. White Dispute Resolution Center, at the University of Houston Law Center in 2003. Mr. Cook is notable for being a founding member of the school law section in the State Bar of Texas in 1970, and was its first chairman. He is currently an associate member of the American Board of Trial Advocates, a role he has served since 2010. Mr. Cook is also a member of the Houston Bar Association, the Bar Association of the Fifth Federal Circuit, and the New York State Bar Association. Mr. Cook started earning accolades when he became a fellow of the American College of Trial Lawyers in 1983, and in more recent years was named to Texas Super Lawyers by Texas Monthly from 2003 to 2004 and from 2006 to 2016, as well as Houston’s Top Lawyers by H Texas and Bayou City Publishing in 2004 and 2006. His name graces the bylines of numerous legal articles, and he is admitted to practice in New York and Texas, as well as the U.S. Supreme Court, the U.S. Court of Appeals in the Eleventh and Fifth Circuits, as well as the U.S. District Court for the Eastern, Northern, Southern, and Western Districts of Texas. He has represented Fortune 500 and NYSE companies in litigation, as well as property owners, banks, and general partners. Representation of oil and gas lease owners against Fortune 500 company in gas purchase agreement litigation. Martindale Hubble rating – "Preeminent-AV"